Tesla is launching a Model 3 display fleet in Europe this week. The automaker sent out invitations to Model 3 reservation holders across Europe to come see Model 3 in stores. Ahead of the launch, Tesla is now drumming up some demand for the vehicle by giving reservation holders the chance to see the car in person. We received dozens of reports from Model 3 reservation holders across Europe receiving invites to see the cars today. 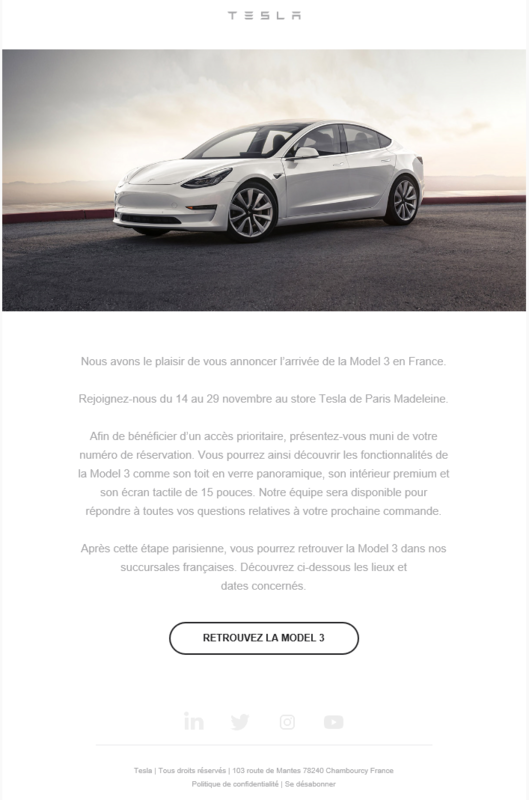 We are pleased to announce the arrival of Model 3 in France. Join us from November 14th to 29th at the Tesla store in Paris Madeleine. In order to benefit from priority access, present yourself with your reservation number. You will be able to discover the features of the Model 3 such as its panoramic glass roof, its premium interior and its 15-inch touch screen. Our team will be available to answer all your questions about your next order. After this Parisian stage, you will be able to find the Model 3 in our French branches. Discover below the places and dates concerned. Tesla is also planning similar Model 3 displays at stores across Europe. We received reports from reservation holders in France, Belgium, Germany, Sweden, Norway, Italy and we are still getting reports. When launching Model 3 in the US and Canada, Tesla took a similar approach earlier this year by making a small display fleet available to reservation holders. Today, Model 3 is displayed in virtually all Tesla stores in North America. But it first started with rotating stores, which appears to be the approach in Europe as well. We reported last week that a Tesla Model 3 with a different plug was spotted ahead of the European launch. Tesla is using a different plug in Europe and the start of vehicle production with the connector would be a good indicator that the automaker is preparing to launch in the market.